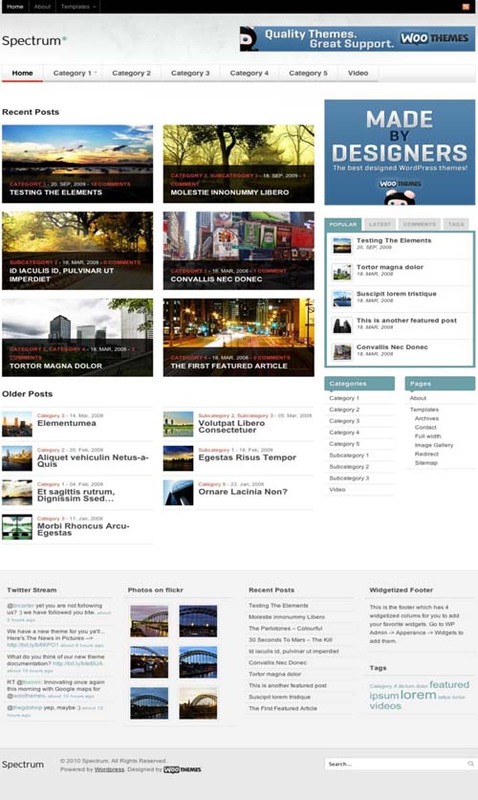 Spectrum WordPress premium theme is a visually rich magazine theme for content rich sites showcasing their content. It has beautiful imagery. It is packed with 7 widgetized regions and lots of custom woo widgets, like a video player, Flickr and Twitter streams, to customize huge amounts of the theme on the fly. It has custom home page layout with featured scroller, recent blog posts and older blog posts, along with 7 widgetized zones. 10 delicious colour schemes to choose from. Option to change background color, upload background image, change color of links and buttons in options panel.